Herostat= heavily edited Noelmahc: Hawkeye>Wolvie, Cap Marvel>Invis Woman, Widow>Spiderwoman= Hawkeye finisher works(90-95%), Ronin unmasked OK as a skin (elektras second). 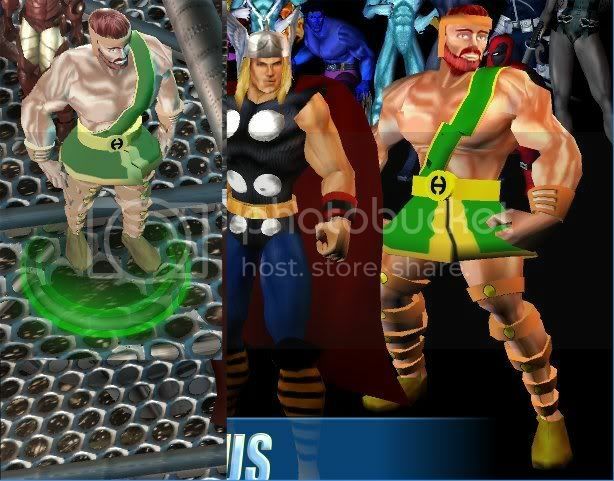 Herostat= Extraslots PSP: Hawkeye added as 20301 etc= Hawkeye finisher works(90%), Ronin unmaskes skin ok as Elektras 2nd skin. Herostat= Durfals Ronin/Hawkeye: hawkeye finisher OK (90%), Ronin unmaskes works as second skin for ronin (though I still cant get her powers to work, even though I think I've put all the necessary files from your PSP fixed mod in the proper places). 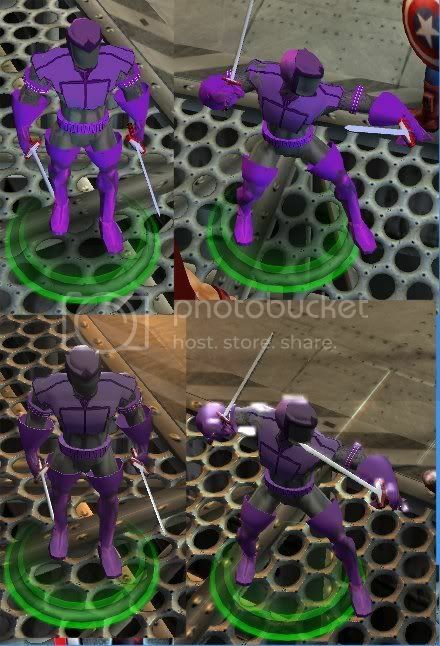 Fun fact I dont fully understand: In the Hawkeye>Wolvie herostat game, all Hawkeyes bows arrows etc are visible at once in game untill you use a power then they appear/disappear as they should, but with the other two herostats, (where hawk is 203 not 03) everything is as it should be from the very start. Presumably the game tells the mesh to hide stuff at the start based on the herostat number, then uses the keyframes thereafter. Sort of worth noting where one character will replace another. Ackshully, it only depends on what built-in boltons got defined in the herostat. 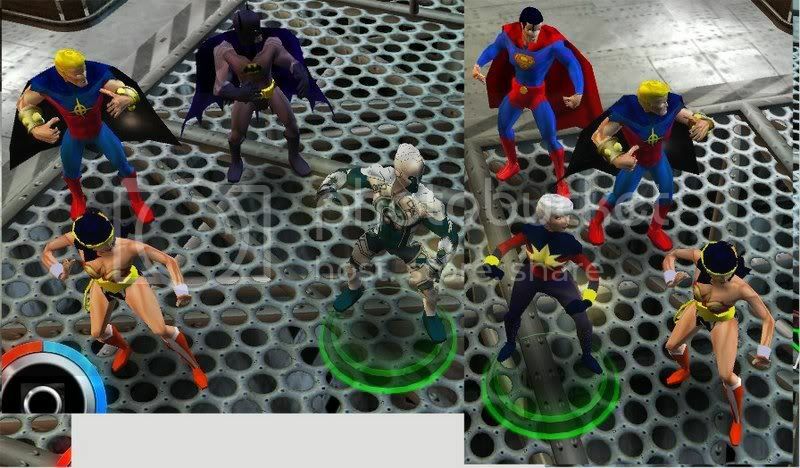 When we used the Wolvie replace ones, we didn't define them, so they work screwy in-game. And I edited my last post -- I found out that I simply put the unmasked skin into the wrong slot because the slot numbers for Ronin do not match up the skin numbers. I was using the PSP-Fix instead of the PSP-v2 file, that's why it didn't worked. Now I have a functional Clint (have to try the boosts, x-treme and fire/cold attacks yet). EDIT: Ronin's flying nunchakus keep crashing the game, but everything else seems to work just fine. Yeah, yeah, I've already written the solution for the Ronin crashes across half this board. I'll be upping a patch to fix it for those who can't do it themselves ASAP. Because nobodyasked for it, I made a Hercules mesh. Works well as a Colossus replacement, but you need to change the scale from 1.3 to 1.1 in herostat. That's not Thunderbolts Hawkeye. 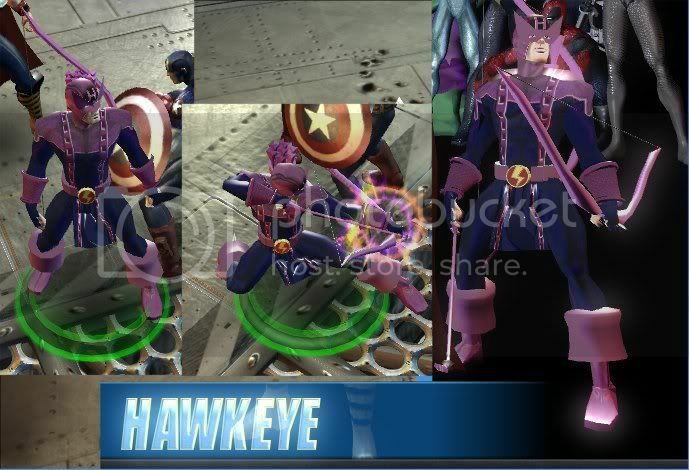 Ive downloaded it (twice) and it seems you inadvertently uploaded Classic Hawkeye, again. Yep, that's the one. Thanks! Testing reveals: the machine gun is out of alignment with the animations. Doesn't point correctly, distorts the laser sight like you wouldn't believe. Also, her head's not got the full free range of movement for anims, kinda like the issue we've had with your early Hawkeye builds. Can be seen well on the character selection menus. 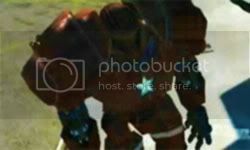 But, still, we finally have the fourth mannequin stand-in, as well as stuff to test powerfiles against. The knife still doesn't work, BTW, and the built-in one doesn't appear for me. Not ever. Nuh-uh. Re: Mgun alignement. Trust me, I adjusted and fiddled and tweaked that ^%$#ing gun a LOT, and thats the best I can get for now. I think that it may be that my mesh is slightly smaller that the MUA one would have been so it'll never line up quite right. Bottom line, I hate that the widow uses guns and knives (shes got a widows sting right there on her wrist that causes Hercules more pain than a bullet for fecks sake, so why would she use a gun?) and am not inclined to waste my life bringing Bendis' stupid, stupid, stupid versions of characters to life. But since I'll look at the other problems, I'll take another half-arsed stab at aligning the gun, but will not devote my remaining life to fixing it. RE: the Head movement, I'll look into it, can't say I've noticed it myself, but my "ugh! widow with guns!" factor may be damaging my quality control here somewhat. RE: the knife. Works for me on the heavy attack, but not on the stupid "knife bomb" power(Is it a knife? Is it a bomb? Because a knife that will blow your hand off, or a grenade that will cut you if you grab it is kind of dumb, frankly). I'll look into why not. Half-arsedly. 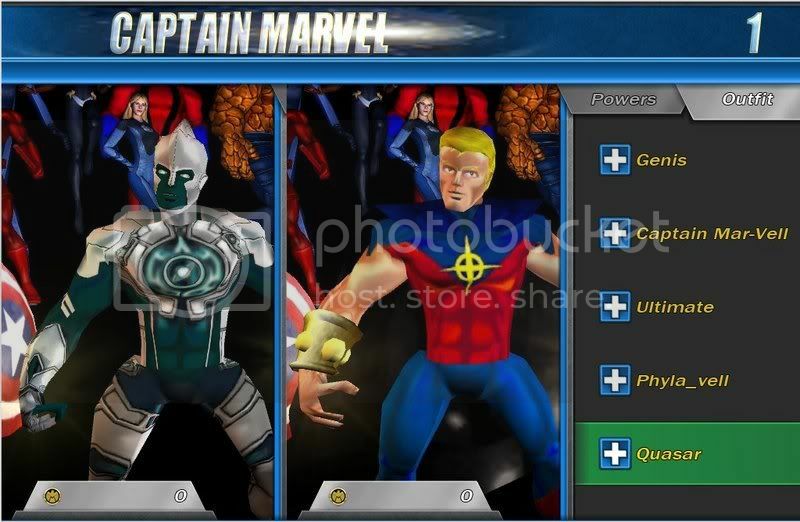 All can be used as Captain Marvel skins (though Quasar works quite well as a Warbird skin too).